Excellent breakfast, building a little dated, surroundings could be cleaner. Good for the money you pay. all good it's comfortable and very good breakfast. nice view. Service of staffs here. Fast responsive and willing to help. Spacious room and the hotel provide everything i need, plenty and many menus of breakfast (eventhough all the menus are same everyday but i could try something new everyday from my 5 days stay there), helpful staffs. The receptionist was welcoming, the cooking staff was always willing to help with our needs. Breakfast was nice and lots of option present for breakfast. Location is proper. One of our top picks in Shanghai.Holiday Inn Express Zhabei is a 5-minute walk from Shanghai Train Station, Shanghai Long-Distance Bus Terminal and Shanghai Tourism Center. 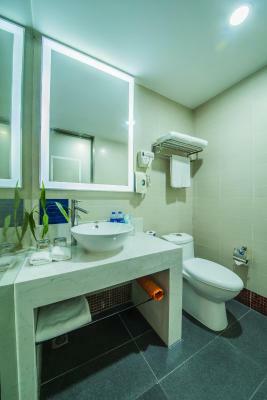 It features affordable rooms featuring free internet access and a flat-screen TV. Popular attractions such as Nanjing Road Pedestrian Street and People’s Square are a 10-minute drive away. 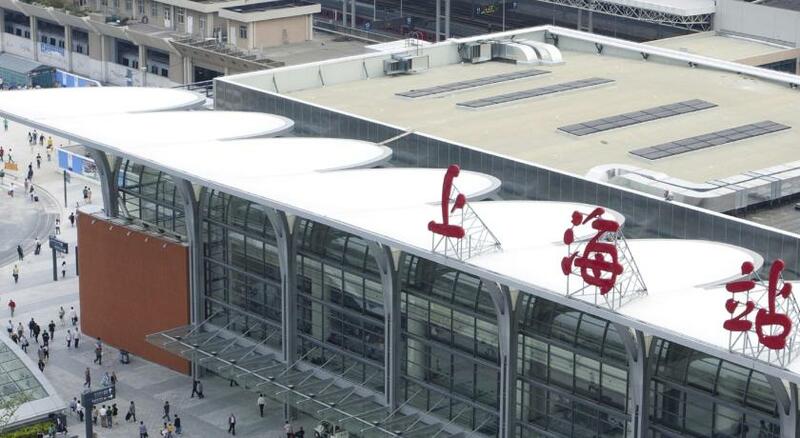 Shanghai Railroad metro station (line 3 and line 4) is an 8-minute walk away. 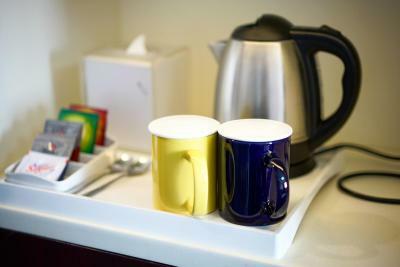 Guest rooms at Zhabei Holiday Inn Express are equipped with air conditioning and plenty of work space. They feature satellite TV and a tea/coffee maker. A safe and hairdryer are also provided. A tour desk helps guests with trip planning and offers information on local attractions. The hotel’s business center provides fax/photocopying services. Currency exchange and laundry services are also available. Buffet breakfast is served at the hotel’s cafe. The hotel’s lounge serves light meals and drinks. Shanghai Hongqiao International Airport is a 30-minute drive from Holiday Inn Express Zhabei. Pudong International Airport is a 60-minute drive away. 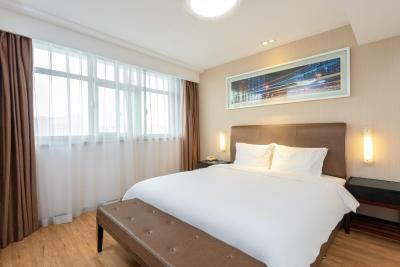 When would you like to stay at Holiday Inn Express Zhabei Shanghai? Suite features a separate living room and a large double bed. It will offer a flat-screen TV, sound system, work desk and private bathroom. 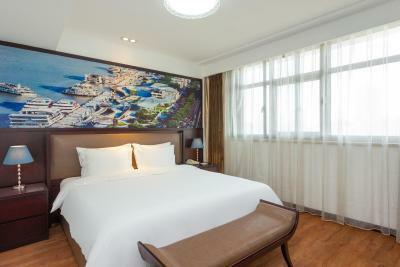 Room comes with a large double bed and a flat-screen satellite TV. Room comes with 2 single beds and a flat-screen satellite TV. Features a 32-inch flat-screen TV with satellite channels, free high-speed internet access, iPod dock with clock radio and free tea and coffee. This family room has a seating area, toaster and air conditioning. Choose the good-value Holiday Inn Express Shanghai Zhabei for a convenient location and transport links, 15 minutes by taxi from Nanjing Road. The staff at the high-rise Holiday Inn Express Shanghai Zhabei hotel offer a warm welcome on your arrival, 30 minutes by taxi from Shanghai Hongqiao International Airport. Only a 5-minute walk from Shanghai railway station and subway station, this modern hotel is in the downtown Puxi area of Shanghai. You can surf the web with complimentary high-speed Internet in the comfort of your spacious, air-conditioned Guest room. House Rules Holiday Inn Express Zhabei Shanghai takes special requests – add in the next step! Greatwall Dragon Holiday Inn Express Zhabei Shanghai accepts these cards and reserves the right to temporarily hold an amount prior to arrival. Holiday Inn Express Zhabei Shanghai accepts these cards and reserves the right to temporarily hold an amount prior to arrival. Please note that the hotel will collect a refundable deposit of CNY 200 upon check-in for incidental charges. Very poor menu for vegetarians. Communication skills of front desk was a big issue. Very poor menu for vegetarians. The location was okay. I liked the buffet breakfast- lots of food to choose from. Change in menu for everyday needed. Breakfast is good but same menu for every day. Near to shanghai metro and railway station and very easy to commute. · All 5 days same menu for breakfast and breakfast place was too crowded, looks like restaurant is not designed for full occupied hotel rooms. Very adement attitude to extend checkout time for 2 hrs, hardly extended for only 1 hr Although I have not taken early check in. Entrance / reception lobby is so small like if 15-20 people want to wait for some time after chk out is not possible. We arrived and our booking didn't exist in their terminal. We had to call booking.com in the UK to sort it out. Once in the room it stank of smoke and we had to change it. Staff spoke little English. To use the laundry facilities it's a bit of an adventure. Poor choices for breakfast. Literally this hotel is only good if you are visiting Suzhou and Wuxi as its next to the train station. Otherwise please avoid. The area around is a dump with no decent restaurants. The staff can’t communicate in English. Also, booked online through your website but they can’t find the booking based on the device used as translator. We were charged higher than the stated rate. The staff was very helpful and upgraded our room to a suite on arrival. The hotel is right next to the railway station so is fantastic for catching the metro. The rooms are so old .